​​The GatorEye Unmanned Flying Laboratory (GatorEye UFL) is a new sensor suite with dual flight platforms built with funding from co-directors Drs. Broadbent (pilot and flight ops) and Almeyda Zambrano (applications and flight ops). The GatorEye is of scientific interest to many faculty, researchers, and students at UF and around the world. The sensor package includes a Headwall Photonics VNIR 270 spectral band hyperspectral sensor with Hyperspec III software to control polygon acquisition areas and which can be manually triggered from within Phoenix software, a Phoenix LiDAR VLP-16 dual-return LiDAR sensor capable of 600,000 returns per second with Phoenix live and post-processing software, and a global shutter gige RGB camera bore-sighted to all sensors to RGB colorize LiDAR point clouds. All sensors are bore-sighted to enable immediate live 3D LiDAR data feed and a live visual feed via visual cameras (GoPro Black) on the flight platforms. Lever arm values are calculated using multiple Inertial Explorer runs until XYZ asympototes are achieved providing < 3 mm accuracy. Upcoming improvements include integrating: (a) a Gobi radiometric thermal sensor, (b) an improved longer range and higher density LiDAR sensor, (c) a very high resolution RGB camera, and (d) a GatorEye mounted LI-200 Pyranometer. Funding is currently being sought for these upgrades. This sensor suite is geolocated to +/- 2.5 cm using a dual frequency GNSS and post-processed kinematic algorithms relative to a base station, and with orientation obtained from a high-resolution tactical grade Inertial Movement Unit (IMU) (STIM 300) post-processed against a dual-frequency base station using Inertial Explorer software. The location of the base station itself is determined using the online Trimble CenterPoint RTX post-processing platform, providing typically < 2 cm 3D uncertainty with a 2 hour collection period (and < 0.25 cm with 4+ hour collections). The flight platforms include both a vertical takeoff and landing (VTOL) DJI Matrice 600 Pro hexacopter capable of 16-22 minute flight times for smaller areas (<20-30 acres per flight, and with 5 sets of batteries currently available for multiple flights per day) and with a 5 km telemetry / control range, and an Applied Aeronautics Albatross fixed-wing platform capable of 3+ hour flights with live video and telemetry feeds of up to 100 km via a UAV antenna tracking system at the ground station, and which features redundant tracking systems. Mission planning and ground station software is Universal Ground Control Station (UGCS) for the hexacopter and Mission Planner and UGCS for the fixed-wing. Mission design uses terrain following to achieve consistent above-ground level (AGL) throughout the collection. Typical missions are conducted at 65 m AGL and at 6 m/s, but lower and slower is possible for higher LiDAR point density. ​Photogrammetric processing of RGB images to 3D surfaces and orthomosaics is conducted using Pix4Dmapper Pro on a customized workstation (256 GB RAM, 20 Cores * 40 processors on dual boards, 8 drive RAID, dual-Graphics cards, fused dual network with 600 MBS connection) at the Spatial Ecology & Conservation (SPEC) Lab. LiDAR data is processed and RGB colorized using Phoenix SpatialFuser, QT Modeler, Global Mapper LiDAR, LASTools, and custom IDL algorithms. Products include: DSM (digital surface models), DTM (digital terrain models), CHM (canopy height models), slope and aspect, and those under development are interior forest structural density and heterogeneity indices. Priority applications include assessment of above ground biomass, habitat assessment for biodiversity, and forest degradation monitoring through multi-temporal analysis. Hyperspectral data is processed using Headwall Photonics Spectralview III, to create ortho-rectified radiance imagery (mW/(cm2 * sr * µm), which is then converted to reflectance (following scaling to µW/(cm2 * sr * nm)) using Fast Line-of-sight Atmospheric Analysis of Hypercubes (FLAASH) in ENVI/IDL. Current work is on developing a (a) custom 3D voxel based, calculated directly from LiDAR point clouds, ortho-rectification algorithm, (b) algorithms to correct radiance saturated pixel-bands, and (c) the development of a 'shade normalized reflectance' product (Broadbent et al. In Prep), including topographic corrections (e.g., hills to canopies), as well as atmospheric shade (e.g., clouds). We also plan to compare reflectance products derived from FLAASH with ATCOR-4, and are interested in developing an approach to parse hyperspectral signal in 3D via LiDAR point density distribution (e.g., ground vs. understory vs. canopy). Products under development are a suite of vegetation indices, including NDVI, EVI, ARVI, Xanthophyll, Lignin, fPAR (fractional Photosynthetically Active Radiation) and LAI (Leaf Area Index). We are working to integrate with the PROSAIL radiative transfer model to derive vegetation biophysical properties. Priority applications include tree diversity mapping, and plant stress monitoring (e.g., drought, invasion), as well as linking above to below-ground processes in ecosystem ecology (e.g., soil gas flux). Sensor fusion and product generation is conducted in ENVI + IDL, and eCognition (in development) geospatial analysis software linked with ESRI ArcGIS software. Data collection campaigns have been conducted and are ongoing in the US (Florida, Georgia, Vermont, and New Hampshire), and in Mexico, the Brazilian Amazon, Atlantic Forest, and Cerrado, and throughout Costa Rica and Peru. Missions being planned are in Hawaii, Panama, Ecuador, Bolivia, and Malaysia among locations. If you have an research collaboration you would like to discuss please contact Eben Broadbent or Angelica Almeyda Zambrano directly via email. Thanks for your interest! While the GatorEye UFL is a fully functional system, we consider it as beta 1 and a proof of concept for sensor fusion in UAS and are actively working on designing a beta 2 system, which would incorporate longer range LiDAR, increased hyperspectral capacity, higher res RGB and multiple thermal sensors, for which we are investigating potential sources of funding. Sample Data: For viewing only, please see some sample LiDAR and hyperspectral data below. ​Sample post-processed LiDAR data, DEM, and DSM. 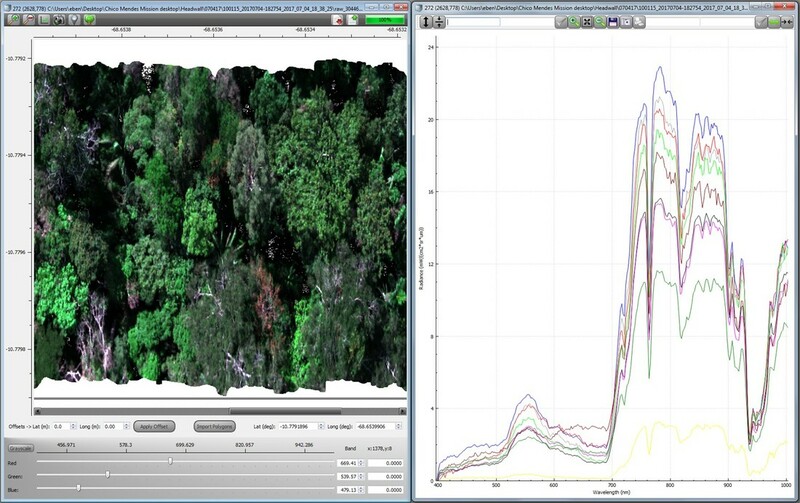 To view hyperspectral images, you could try: Multispec online, although we recommend ENVI software.